Fujitsu announced yesterday that it will use its biometric palm vein authentication technology in a public library in Naka city (Ibaraki prefecture, Japan). 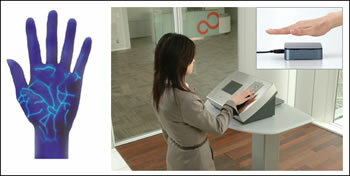 Fujitsu's contactless palm vein authentication will eliminate the use of library cards. Naka city was established on January 21, 2005 with the founding principle of creating harmony among nature, the culture of the region, its people and cutting-edge science. The system is contactless and therefore hygienic for use in public areas. Rydell pressed his hand within the outline of a hand. He hated the way that felt. Bad cootie factor with those palm-scan things. Hand grease. Read more at the Palm vein authentication technology press release via WWMNA.